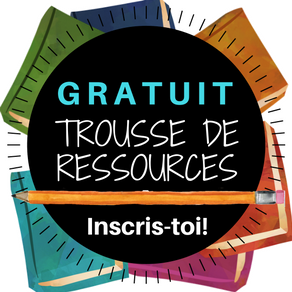 Sur la même note que l'entrée précédente, je viens de trouver un autre trésor sur le site de Teach Thought. J'aimerais vraiment trouver ce genre de blogue en français... vous connaissez? 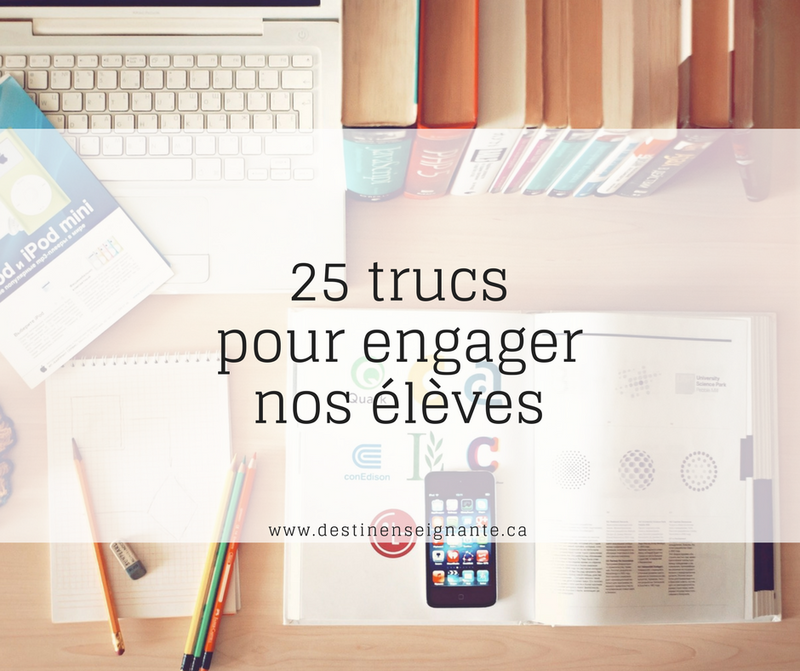 Cet article donne des trucs concrets pour rendre nos leçons plus intéressantes et engageantes pour nos élèves. J'ai bien hâte de mettre certaines de ces stratégies en place. Elles sont classées par matière. Over the years, I’ve noticed how one question can change the dynamics of any situation. Everything might be moving along quite nicely at the dinner table, everyone’s happy and laughing but one question can send those same smiling faces into a frenzy of shouts and upset. This also holds true in a classroom. Students may be working quietly and the teacher might be content but one question or comment from a student or the teacher can turn that quiet into bubbling sea of chatter. Beyond textbooks and worksheets, at the core of every basic lesson lies the key to teaching students anything and everything–student engagement. Routines give rhythm and security to any learning environment. For students, the rhythm begins with knowing that when they enter the classroom, they need to begin writing in their journals about the topic on the board. In another class they might start with a set of problems to solve. In yet another, they might pick up from where they began with the lab work they left behind in the previous class. 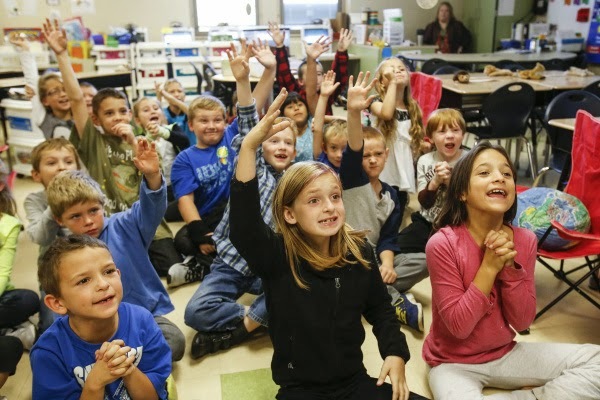 In online classrooms, routines give students order and direction. It’s when these routines turn into lullabies that it’s time to change the rhythm. These suggestions aren’t meant to become a project where the teacher spends endless hours planning. These are just quick tricks to step up the beat so that students stay interested. Multiplication and money go hand in hand. Word problems center on pulling apart large amounts into smaller ones and the number of $5, $10, $20, and $50 dollar bills which make up the equations. Beginning class with a lesson in multiples only makes practical sense. So, students write times tables then often answer a word problem to demonstrate multiplication. After the routine sets in, add music—actually add rhythm. Teachers can take it as far as you want, with short tapping, dancing or even a jump rope routine, but be sure not to penalize students who aren’t good at this part or don’t find it helpful. It’s simply a break in a routine. Students may be learning the basics of measurements or even learning the conversion table. Either way, repetition helps understanding settle in. But, once it’s clear that this has happened, break into the pattern and challenge them. Challenge them to bring in objects to measure or weigh. Suddenly the lesson becomes three-dimensional and the daily routine has a heartbeat. With mental math lessons, students are practicing multiples in conjunction with addition and subtraction. They may also be rounding and working on place value. So they answer routine questions daily. Then move on to more challenging formats and ask students to create their own problems. Essentially, all mental math equals visuals so give them a series of problems with lollipops or any other candy that you know they’ll love. Then, reward them with it once they solve the problem correctly. Whether it’s a lesson in associative property of multiplication or distributive property of multiplication over addition, repetition of the ideas creates comfort for students. However, application seals it in their minds so add a little challenge into the routine. Have students plan a party. Give them a budget and a quick list of criteria to complete such as a shopping list and a supply list. Students can partner with each other or even work in groups of four. Students must practice equations and word problems constantly in order to keep their minds focused. For a practical problem such as y + 8 = 32, students work their answers easily and move to more complex equations quickly. Fine. Then, they get the challenge of the word problem and essentially, so do you because you have to make sure they’re still learning. Bring in grapes or nuts or chips. The idea is that you allow students to focus on an object or reward to motivate them to create word problems centered on their object of devotion. Again, they do the creating. They’re motivated. You’re free to teach within their enthusiasm. Never before has just the act of reading on a daily basis been more important to a student’s learning experience. Making sure that students can form words correctly and sound out new ones can be a tiring task for teacher and student. Simply ask the students what they’d like to read and only read that no matter how simple. It builds confidence and gives them a feeling that they have some control over what they’re learning. It would only follow that if a student achieves fluency then they should be able to comprehend what they read. That’s not always the case or teachers wouldn’t spend so much time reading passages and having students answer comprehension questions. After several days of reading and answering questions have students ask the questions. Tell students to ask the questions and have them quiz each other, either in groups of 2 or 4. It can be a large-scale challenge or a small one. The idea is that they are in charge. Whatever the grade level, teachers are constantly making sure students are acquiring new vocabulary. But, while matching definitions and looking up definitions may clarify the meanings of the words, it doesn’t ensure that students will remember the words. Simply enough, at least at first, have them build a story together. Each student takes a word and begins a story with one sentence. This takes 10 to 15 minutes and means a lot to them in the end: attention, laughter, and challenge. There’s nothing more important and more difficult than teaching the central or main idea of stories large and small. Right when you think they’ve got it, students turn around and give you the completely wrong idea. So, it’s important to keep training them by constantly asking the same question. When teachers start to feel themselves collapsing, the class may collapse too. Turn your class into a fishbowl. Put six or seven chairs in the middle and the rest surrounding those. Switch out students throughout the lesson. The students in the middle have to come up with the main idea and the students on the outside take notes and critique them. Analysis for short stories or novels requires a lot of critical thinking questions in which students justify their answers with evidence from the story. Without analysis infused into daily lessons students would be lost in any subject requiring them to think outside the box. When practice becomes redundant, have them be the characters. Have them write a one-page response to the class from the characters point of view. Have the character analyze them. The character could be humorous or angry or even bitter about the whole thing. Whatever the view, it should give them some added interest. Daily journal writing is a great way for students to practice expressing their opinions on most any subject. Teaching them to respond to different questions gives them a sense of comfort with various topics. Ask a deliberately uncomfortable question. At this point you should know your class pretty well, so asking this question shouldn’t be too difficult. Just make sure that it’s within the limits of being appropriate for their age group. Teaching structure is like pulling teeth. Students either love it so much that they sound like robots or they hate it so much that they fly off topic after the first couple of sentences. Forcing them to remain on topic on a daily basis means they’ll do it automatically when under pressure. Students who hate structure love bubbles. Students who like structure love boxes. Tell them to use either for the next few daily lessons and insert their information accordingly. When they check over their work, they must then write anything unfocused outside the bubbles or circles. Students usually enjoy persuasive essays until they’re on their fortieth prompt and it’s still the beginning of the school year, so mixing things up becomes more than important. There’s something about doing the same thing, only bigger that makes students pay attention. Break the room into groups of four or five. Have them brainstorm and work on introductions one class period then put it on a poster by the end of the class. The same can be done for the three supporting paragraphs and conclusion. One of the most misunderstood formats that students write, expository essays need constant practice depending on the grade level. There are several variations within the essays themselves. But, students begin to gripe about it after they’ve gotten over the first groans of protest and are deep into their routine. Gummy bears, chocolate, Skittles, or whatever candy they love to snack on. Have them research how it’s made then write about it. The essays that receive above a “B” or include certain criteria win free packages of their favorite candy. It all depends on how deep the lesson needs to go. Identifying parts of speech and how to use them may mean endless reviewing and writing. Picking apart sentence structure and practicing syntax requires discipline. Diagramming sentences feels like a routine vaccine visit unless you add some interest. Have students first read a high-interest story then pull some sentences from that. This will break up the lesson but also give the student and teacher a better idea of what’s really being learned. While learning about the solar system makes for an interesting lesson for most, some of the actual terminology needs repetition to be learned. After they’ve learned all the basic planets and that Pluto is now one of the dwarf planets, offer a challenge. Acids and bases, atoms, chemical equations, and so forth require reinforcement with repetitive lessons. But, minus movies and lab experimentation, try sealing in some of the terminology with some twists and turns. The familiar world around us changes when we look at it differently, so have students find chemistry in their everyday lives. Challenge them to bring in various items as you move forward in the lesson. Simplicity matters. Use tea and add lemon to demonstrate the lightening effect. Teaching energy efficiency, renewable energy, thermodynamics, or energy transfer gives students the knowledge they need in order to become literate in the subject matter. If the daily lesson involves answering a set of questions or rewriting definitions or simply reviewing, don’t allow the information to float away. Simply asking students what they think of the way the school uses energy may be enough. Have them continue to follow their lesson but tell them to look around them and bring in five alternatives to the way their school consumes energy. The idea is that students are doing the work and finding the solutions to problems while doing one of their favorite things: complaining about school. Biotechnology, cells and cell processes, and genetics are among the many topics covered in Life Science lessons. Although interesting enough, the lessons require students to acquire and use new vocabulary as well as connect all the new concepts introduced. Making sure students retain this information can be a challenge in itself. The key remains repetition with connection. Ask a simple question. How does our study of minerals help us search for extraterrestrial life? Then, let them argue their points and challenge them to use what they’ve learned about minerals so far. Students love to look at maps and pretend they know how to read them. They love to take notes on them and act like they’re experts after a day’s lesson. But, ask them to answer a question about distance traveled or where a team of travelers ended its journey and students suddenly have no idea where to start. Have them use their maps and create points in the class that represent a point on the map. It takes five minutes to put together and students love it. Add a reward to the mix, and they’ll like it even better. Teaching the branches of the government and how they work may be important but it can be an excruciating process. So many students despise the thought of it. So adding interest needs to be sprinkled throughout the lessons. There’s no other way to get students to learn this part of social studies than to tell them to find a story on a weekly basis that’s related to the topic at hand. Or, just have UpFront, Scope, or Time for Kids available in the classroom for students to find stories that apply. One of the most important lessons taught to students, this gives them a deeper understanding of right and wrong and why laws exist and need to be enforced. Sometimes students see it as ancient history though. So keep it current as well. Ask the important question: How have things changed? Have them list it or journal it then expand on that as the lesson continues. They need to understand their relationship to it. Teaching students about the Revolutionary War may be interesting to the two history buffs whose eyes sparkle when they hear the topic. But, the rest of the class might be going comatose. So, give them options. Ask students what they would’ve done without air conditioning or even electricity considering that it had just been discovered. Ask them what they would’ve invented. Possibly assign them inventors to research. Teaching world history can actually be a very interesting lesson for students because they learn so much about parts of the world that they otherwise may never have known. However, ingesting this information means a lot of textbook chapters. To break the routine, just think of the wild, imaginative stories created by cultures around the world. Add Stories, Myths, and Legends. Learning about countries and their unique cultures through myths, legends, and other stories makes the countries live inside the students’ minds and gives value to their knowledge. So, ask them to bring in an article or information about a legend or story unique to a particular country then share it with the class. Les devoirs : pour ou contre?